The charming and highly sought after Pacific Grove neighborhood of Central Avenue/downtown encompasses prime land on Lighthouse Avenue from Del Monte to David and extending out to the coastline. Homes in this story book neighborhood are most often historically significant and express unique character, from decorative Victorians to Arts and Crafts architecture and Craftsman design. Founded in 1875 as a Methodist Retreat, homes in Pacific Grove still retain their historic roots, and many have been converted into current usage as restaurants, offices and Inns. Lighthouse Avenue is the heartbeat of Pacific Grove and is a tree lined street dotted with small boutiques, cafes, restaurants and offices. The Pacific Grove Library and Post Office are located in the neighborhood as well as the award winning Natural History Museum. A destination for travelers, the area boasts numerous B&B’s and Inns that give guests a glimpse back in history with period details and cozy ambiance. Referred to by locals as simply, “PG”, the town has the lowest crime rate in Monterey County and is often deemed “Americas Last Hometown.” It also holds the distinction of having the most Victorians per capita of any other town and has the oldest continuously operating lighthouse on the west coast. If you walk to 165 Fountain Avenue you will find a plaque on the building at the corner of Ricketts Row, which was the original laboratory of Doc Ricketts who was immortalized in John Steinbeck’s novels. 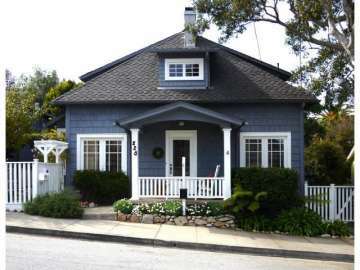 The Steinbeck Family Vacation Cottage is located on the corner of Ricketts Row and 11th Street. The downtown has a relaxed, friendly energy where shop owners know patrons by name and a quiet hometown feel that is preserved and cherished. While strolling down Lighthouse Avenue you will be welcomed with bold blue peeks of ocean as you look towards the coast, invigorated by the fresh ocean breezes. Click here to view all available homes for sale in the Central Avenue/downtown neighborhood of Pacific Grove. For all available Pacific Grove real estate, click here. In 2018, 21 homes sold in this neighborhood. The most expensive home to sell sold for 1.799 million for a 3 bedroom, 2.5 bathroom home with 1,900 SqFt of living space on a 3,500 SqFt lot. The least expensive home to sell was a 2 bedroom, 1 bathroom, 870 SqFt, beautifully remodeled condominium and sold for 535K. In 2017, 17 homes sold in this neighborhood. The most expensive home that sold, sold for 3.5 million for a 3 bedroom, 2.5 bathroom, Arts & Crafts style home with 3,762 SqFt of living space on a 12,471 SqFt lot across the street from the Ocean. The least expensive home that sold was a 1 bedroom, 1 bathroom condominium with 760 SqFt of living space and sold for 475K. In 2016 18 homes sold in this neighborhood. The most expensive home sold for 1.56 million and featured 4 bedrooms, 2 bathrooms with 2,215 SqFt of living space on a 5, 227 SqFt lot located across the street from Jewel Park and just 1 block to Lover’s point. The least expensive home sold for 489K for a 2 bedroom, 2 bathroom end-unit condominium with 1,210 SqFt of living space. 12 homes sold in 2015 in this neighborhood. The most expensive home sold for 1.925 million for a 5 bedroom, 3 bathroom, 2,094 SqFt home with unobstructed coastal views on a 5,275 SqFt lot. The least expensive home sold for 645K for a 2 bedroom, 1 bathroom home with 862 SqFt of living space on a 1,800 SqFt lot just steps to town and recreation trail. In 2014 there were 22 homes that sold in this neighborhood, the most expensive home sold was a 3,600 SqFt Spanish colonial home with bay views on 9,100 SqFt of land, which sold for 2.42 million, while the least expensive home was a 850 SqFt condo which sold for 380K. In 2013, 26 homes sold in this neighborhood. The most expensive home sold was a 2,300 SqFt home on 5,690 SqFt of land, which sold for 1.4 million, while the least expensive was a 750 SqFt condo which sold for 274,500. In 2012 there were 21 home sales within the neighborhood of Central Avenue/downtown. The most expensive home sold for 940K and was a 5 bedroom, 3 bathroom charming Craftsman style home on 5th Street with 2,430 SqFt of living space on a 4,957 SqFt lot. The least expensive home sold for 349K and was a townhome in “The Town House” complex on Lighthouse Avenue. The unit had 2 bedrooms and 2 bathrooms and 1,080 SqFt of living space, a private patio and 1 car covered parking. To own a home in the Central Avenue/downtown neighborhood of Pacific Grove is to own a treasured gem in a historic and breathtakingly beautiful coastal hometown. You will enjoy being steps to the quaint downtown and blocks to the ocean where you can hop on the recreation trail, walk and bike, and enjoy picnics on the sand watching the ocean’s dramatic show and the marine animals at play. A serene and safe place to grow up, homes here are part of the Pacific Grove Unified School District which serves Pacific Grove as well as portions of Pebble Beach. Pacific Grove High School, Middle School and both Robert Down Elementary and Forest Grove Elementary are ranked overall as the highest of all the public schools on the entire Monterey Peninsula. Outside the classroom there are endless opportunities for growth and exploration along the coast as children can easily experience nature and outdoor recreational activities. Whether you desire condo living with great convenience and simplicity or become the proud owners of a historic Pacific Grove home, this quintessential Pacific Grove neighborhood is ideal. With close proximity to Monterey, Pebble Beach and Carmel you are in a central location to enjoy the best of the Monterey Peninsula, from events such as the Pebble Beach Concours d’ Elegance and AT&T Pro Am Golf Tournament to Pacific Grove parades and street festivals. Your neighborhood is truly a one of a kind place to call home, rich in memories from the past and memories to be made.